Sat., Dec. 4, 2010, 6:30 p.m. Compare the map of voters above with the maps below of the way votes stacked up in key races. Statistics may be for losers, as Scotty Bowman once said. But losers who don’t pay attention to statistics may be destined to keep losing. So it might be wise for Spokane County Democrats to consider statistics from last month’s election that show they lost the courthouse essentially because they did poorly in areas that voted well. Well, duh, you might say. People generally lose by not getting enough votes. But it’s the way most Democratic candidates didn’t get enough votes that should have them rethinking their strategies and suggest Republicans could settle comfortably into the “castle” on the north side of the Spokane River as well as expect to hold most of the county’s legislative seats and Eastern Washington’s congressional seat. on can be drawn from comparing this year to the last mid-term in 2006, a pretty good year for Democrats. Bonnie Mager won a county commission seat from longtime GOP incumbent Phil Harris, and held the county treasurer and auditor seats. They won two legislative seats in the 6th District for the first time since the 1930s, and finished on top in county’s tally of the U.S. Senate race. With the exception of the auditor’s race, all of that was wiped away on Nov. 2. The county had about 27,500 more voters on its rolls for this election. But it had about 29,000 more ballots cast compared to 2006. Turnout went up faster than registration, but neither went up equally across the board. Because of population growth and registration drives in the presidential election, some precincts had hundreds more voters on the books than in 2006. The biggest gains tended to be west of Latah Creek and onto the West Plains, northwest Spokane, north of the Y and in Liberty Lake. Some of the slowest was in central Spokane. Because of political winds – chalk it up to a Tea Party awakening, conservative backlash or a liberal “enthusiasm gap” – a few precincts had lower turnout; some had modest gains; others had hundreds more ballots cast. 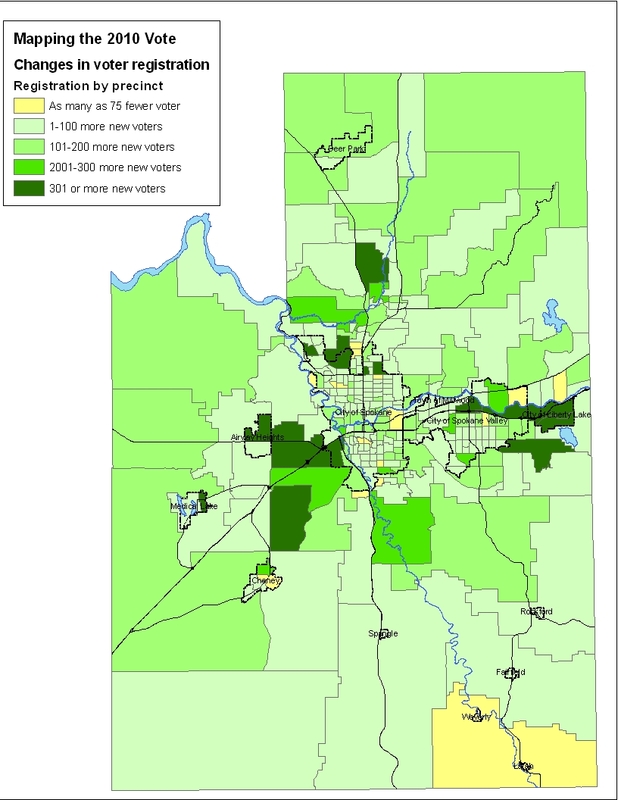 Computerized mapping of the final votes show that most Democratic candidates did poorly in suburban precincts with the biggest gains in voters and turnout while running well in many precincts inside the city of Spokane that had smaller gains, or even losses. In other words, with few exceptions, Republicans won big in the precincts that counted most because they had the most votes to count.